McQuaid's first shot was blocked by Matthew Moyer, but he caught the ball in the air and shot it again before he hit the ground. Sunday’s Syracuse Orange – Michigan State Spartans second-round NCAA Tournament game hasn’t been terribly pretty, but it’s had some memorable moments. 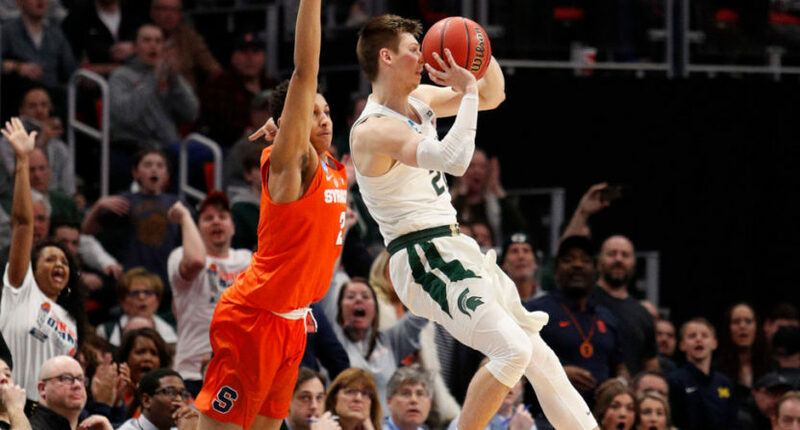 The best encapsulation of that came at the end of the first half, where Michigan State’s Matt McQuaid had his shot blocked by Syracuse’s Matthew Moyer, but caught the ball in the air and chucked it up again just ahead of the buzzer, draining the shot for three points. That’s an incredible reaction from McQuaid, not only catching the deflected ball but recognizing that there wasn’t enough time to set for a shot, instead just throwing the ball towards the hoop. And it panned out, and it gave the third-seeded Spartans a 25-22 lead over the 11th-seeded Orange (hoping to continue their run of college basketball trolling) heading into the half. It may not have been the prettiest shot in the world, but it counted, and that’s the important thing.